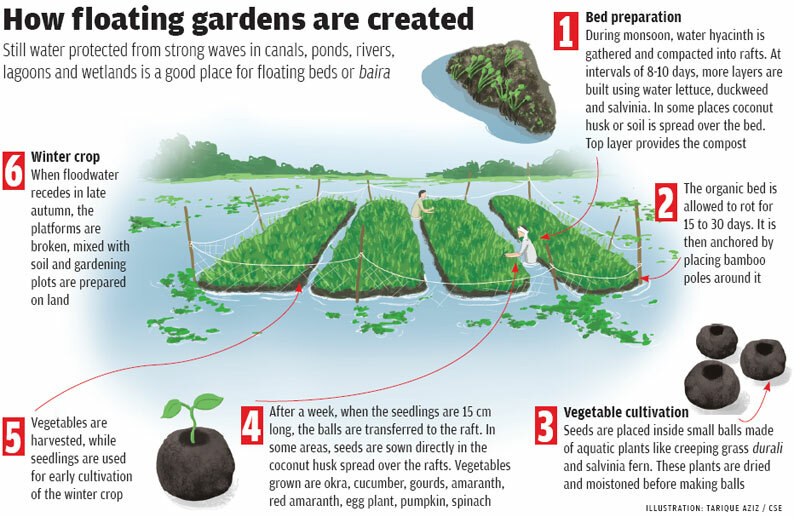 Bangladesh is betting big on its traditional form of farming: floating gardens. Can it help climate-proof the country? LAND IS an ephemeral presence here. In the low-lying wetlands of south-central Bangladesh surrounded by unstable rivers, vast swathes of land go under water for over four months every year. So people have learnt to make the most of flood water. During monsoon when their land is submerged, they gather water weeds like hyacinth or paddy stalks and pile them up in thick strips on stagnant water, beating them into compact shape by stamping their feet. On these rafts called dhap or baira they grow vegetable seedlings and spices. These floating farms are 10 times more productive than the traditional ones and the organic beds are rich in plant nutrients. When water recedes, they break the rafts and use them as compost to grow winter crops on land (see ‘How floating gardens are created’). 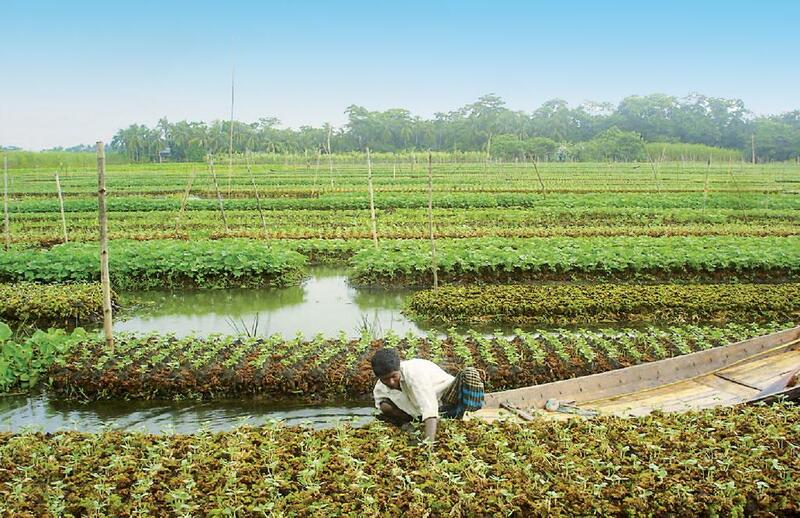 People have been making floating gardens in this tiny region of 25 square kilometres, covering parts of Gopalganj, Barisal and Pirojpur districts, for ages, some say for 300-400 years. Much like the floating gardens in Kashmir’s Dal lake or Myanmar’s Inle lake. Then, around the turn of the last century, came the big bang moment of floating garden in Bangladesh. In the past 15 years, several non-profits have taken it to all over the country. Haseeb Md Irfan-ullah, an aquatic ecologist and development practitioner, calls it a case of mass fascination. He has been involved in promoting floating farms for a decade. The government of Bangladesh saw in this traditional practice a way to adapt to the changing climate that is likely to result in prolonged floods and water-logging in the country. In 2013, it approved US $1.6 million to take it up on a massive scale involving 12,000 families in eight districts. While the government’s approach is commercial, involving big and mid-level farmers, NGOs have promoted floating farms to overcome starvation and poverty. They have involved landless people and marginal farmers. Like Rajeda Khatun of Hariabari village. She lives by the Gumani river in the Chalan Beel region, a large marshy depression north-west of Dhaka. She has a husband, two children and little land. “We used to work as labourers in other people’s houses. For a day’s work I would get 120 taka (Rs 100) but work was available for only five-six days in a month,” she says, sitting inside a duck coop the size of a storeroom floating on the Gumani in Pabna district. The coop is part of a floating garden with a twist—it combines poultry and fishery with farming. Five families take care of this farm that functions round the year. “Now I spend two hours a day here, taking care of the ducks and fish,” Khatun says, wrapping a shawl tightly around her. Ano-ther woman wades through waist-high water to tend egg plants in blue pots and country beans hugging bamboo structures. “Together we make a profit of one lakh taka (Rs 85,800) in a year from this farm,” Khatun says. With a little extra income she could for the first time lease 20 decimal (800 sq m) land. 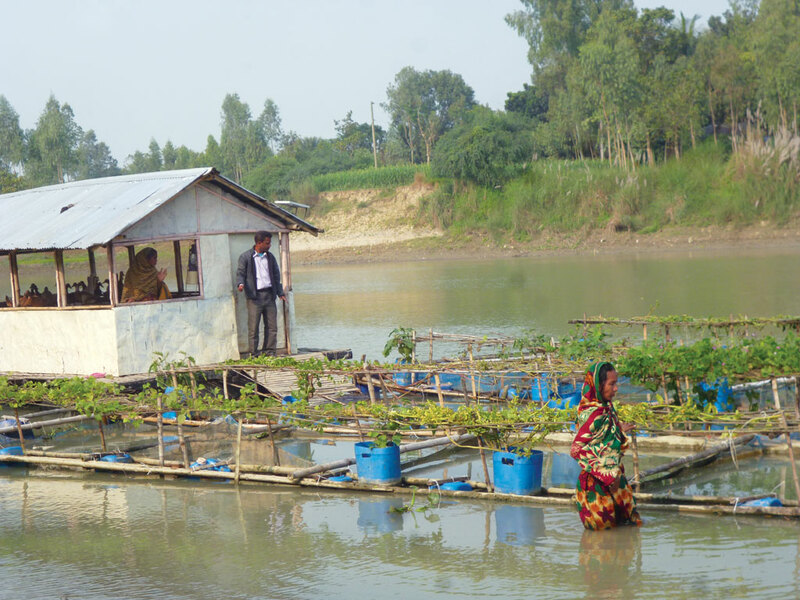 This floating farm is part of a pilot project launched by the Natore-based non-profit Shidhulai Swanirvar Sangstha. In the past three years Shidhulai has built 45 such units on the Gumani, Atrai and Barnoi rivers. It plans to create another 400 units in the next three years. International organisations IUCN and CARE have also trained about 2,000 families in floating farming in 10 districts since 2007. Another non-profit Practical Action has trained some 800 families displaced by river erosion and living on embankments along the Brahmaputra in the north-west of the country. To understand the appeal of floating gardens one has to look at the topographical map of Bangladesh. It is a delta of large rivers descending from the Himalayas that are constantly shaping it like moving fingers in sand. Eighty per cent of the country is floodplains. And when the rivers swell in monsoons, they engulf large swathes of the country, at times two-thirds of it. Several parts of Bangladesh remain submerged for three to eight months, leaving millions of people with little land to grow food on. Add to this the fact that Bangladesh is among the most densely populated countries and also among the most vulnerable to climate change as recognised by the Inter-governmental Panel on Climate Change. Scientists warn that the rising sea level will reduce the gradient of rivers, slowing down the drainage to the sea, thus, increasing the risk of floods and water-logging. They also predict that higher rainfall in the Ganga-Meghna-Brahmaputra river basins and greater glacier melt in the Himalayas may result in more devastating floods. There is no getting away from water in this country and the pressure on land is going to be immense. Planners and development practitioners understand this very well. “In Bangladesh, 48 per cent of the people are landless and one-fifth of the country is under water. That’s why we thought floating garden is a good idea,” says Mohammed Rezwan, the founder of Shidhulai. But introducing floating farm to a new area is easier said than done. Shidhulai went through rounds of trial and error for years to evolve a system that worked in Chalan Beel. “We tried using water hyacinth. It could not withstand heavy rains,” says Rezwan. “Then we switched to plastic pots filled with soil, ash and manure.” These floating farms are very different from the traditional ones. The entire unit floats on empty drums and a tightly knitted bamboo platform rather than an organic bed. Other NGOs have also experimented with the techniques, material and crops to adapt to new areas. Down south where floating farming is traditionally done, raising vegetable seedlings on floating beds is a thriving business. People sell the seedlings to brokers or farmers who grow vegetables on a commercial scale for urban markets like Dhaka. In the north, there is hardly any market for seedlings as water stagnation is not that prolonged, says Irfanullah, a programme coordinator with IUCN. In newer areas farmers mostly grow vegetables for local consumption. Absence of organised agro-business probably explains why many farmers lose interest in floating gardens once the promoting agency withdraws. “I have seen in the north-west when a project is supporting the initiative people show interest but very few continue with their own money,” says Naz- mul Islam Chowdhury, head of the extreme poverty programme of Practical Action. Irfanullah thinks that in the enthusiasm for promoting floating gardens, agencies often overlook their inherent limitations. Though it is seen as an adaptive measure to the changing climate, it is also sensitive to climate change because it depends on natural elements like hyacinth, when the water comes and when it recedes, he says. Floating beds cannot withstand waves or heavy rains. Efforts to scale up floating farms in saucer-shaped depressions called haor in north-eastern Bangladesh, for example, were hampered by the unusual floods of 2007 that came in two waves. Farmers had to rebuild their destroyed beds. The delay meant they could grow only one crop in the monsoon instead of three. Repeated flooding also reduced hyacinth availability because only mature hyacinth is suitable for making beds. Then there is the threat of salinity. As sea water is entering rivers their salinity is increasing. Water hyacinth cannot survive in saline water. “Unpredictable rainfall, shifting of seasons and salinity are going to affect hyacinth. We have to look into alternatives,” Irfanullah stresses. “No doubt floating farms offer a tremendous opportunity. My fear is that lack of proper research could lead to maladaptation,” adds Irfanullah. How much Ban-gladesh makes of this opportunity depends on how quickly it learns from its initiatives. On December 15, 2015, it got a shot in the arm when UN’s Food and Agriculture Organization declared floating gardens Globally Important Agricultural Heritage System—one of the 34 in the world. It adds to buoyancy. Excellent. There is wisdom in this concept as "Technology is Culture Specific". Modernise the Traditional - Traditionalise the Modern.